Zuheily Roman Rosado’s assassin remains at large. 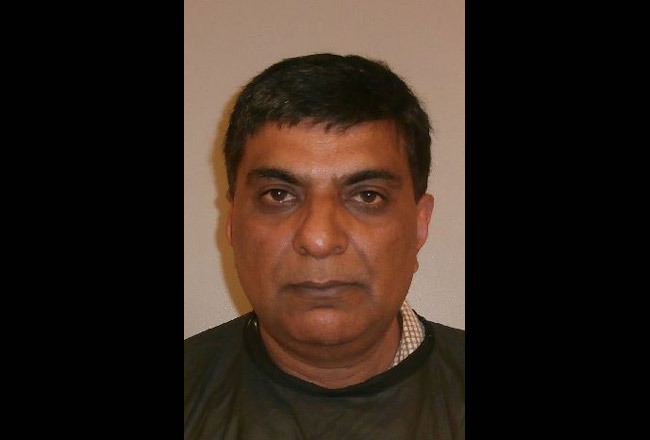 But on Friday, Flagler County Sheriff’s deputies arrested her employer, Mohammed Ansari, 51, of Baypoint Drive in Ormond Beach, on a third-degree felony charge of workers’ compensation fraud. On Feb. 21, Roman, 32, was working the evening shift at the Mobil station’s convenience store on State Road 100 in Palm Coast, near the intersection with I-95, when, at 10:09 p.m., a man in jeans who’d covered his face with a black shirt or cloth walked in, immediately raised a gun with both hands and shot at Roman, killing her. She was behind the counter. On March 12, a Division of Insurance Fraud investigator filed the charge of workers’ compensation fraud and issued a stop-work order, because his workers’ compensation policy had lapsed. Because the policy was not in effect, Roman’s family was denied $7,500 in funeral benefits, and additional benefits of up to $150,000. Roman had six children ranging in age from 1 to 17. The oldest was among the 450 students who graduated from Flagler Palm Coast High School at the Ocean Center in Daytona Beach Thursday evening. Ansari was able to resolve the order and keep the station open. And at the time, he said the matter would be resolved. He paid a $1,000 penalty. As to the lapsed policy,“Somehow they lost a check in the mail, they didn’t get it,” Ansari had said of his insurer in March. “It was an honest mistake.” He said he’d never received notice that the policy was cancelled. “We have proof that all the checks got cashed except this check.” But it wasn’t the first time that his policy had been cancelled, the insurance investigator reported, finding a cancellation on Oct. 29, 2012, in addition to the cancellation on Jan. 7 this year. On April 18, Orlando-based defense attorney Matthew Boomershine filed a written plea of not guilty on behalf of Ansari. The Rosado family has retained Jacksonville attorney John Phillips, who said in a statement Friday that his office is offering $5,000 for “anyone with any information which will lead to the conviction” of Roman’s killer. Crime Stoppers of Northeast Florida is also offering a reward of up to $5,000 for any clues that lead to the killer’s arrest. Anyone with information, which would be kept confidential, can contact detective Mark Moy of the Flagler County Sheriff’s Office at 386/586-4801. Foreigners coming to USA to open/rescue businesses tough welcomed, need to abide by the laws of this land and not of their land of origin. I have the growing concern that many of these newcomers buying our beaten down business small and large corporations, given their bargain prices, will bring their questionable modus operandi from elsewhere here, trying to cheat our laws, seriously endangering our, safety, environment and the already diminished quality of life we still have. This guy deserves to be put in jail for not having work man’s comp. what a shame; i say quit giving your business to this store. look at what has happened on the beach. i will go to 7-11 from now on and buy my gas,etc someplace else. the flagler beach jiffy store has really gone DOWNHILL since they fired all the local’s. no more jiffy chicken for me; oh that’s right; can’t get it before 11am now since Betty was fired and look at the shell since they fired Dawn. I WILL NOT be supporting these stores no more and i suggest you all do the same; notice the beachside jiffy now closes early? jesh can’t imagine why??? WILL IT CATCH ON? I know it will cost us more in the “short term” but if we all stop buying gas and going to these stores maybe; JUST MAYBE; we can have our old employees back??? remember it’s the “LOCAL’S” who make or break these stores. SEE YOU SOON 7-11!! you really think these people care about us??? NOT!!! This poor womans family was denied the money to to a business man who just does not care about the law, he has a history of not paying his bills yet lives on one of the most presigous streets in Ormond Beach. he needs prison time to teach him a lesson, also hit him hard in his wallet so the family can be taken care of. He makes a killing in that station right off I-95, this is a story of greed and it is time people who are secondary parties to crimes pay the price, no room in jail? this is the kind of guy that will be hurt more by hitting him in the wallet.